There are a number of invasive plant species in Illinois. The USDA has identified and listed 102 species that are considered to be invasive in Illinois. This means that the plants and all of their parts pose a significant threat to the Illinois ecosystems in which they can be found. Honeysuckle often invokes the idea of sweet smelling flowers and lazy afternoons drinking sweet tea in the shade. This is all thanks to country music. It is true honeysuckle does have a sweet smelling flower and that seems to be a good thing, at least according to the songs. 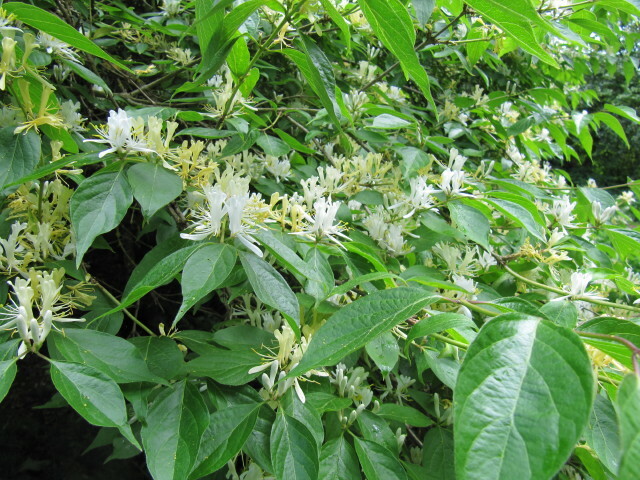 Honeysuckle are in the genus Lonicera and many species and cultivars call Illinois home, but only one is native and 13 are listed by the USDA as invasive. The Native Honeysuckle is a climbing vine with a white flower. Bush Honeysuckle is upright sub-shrub to shrub plants that are having a large effect on forest communities throughout the state. Of the 13 invasive species of honeysuckle in Illinois, four of these fall into the category of “Bush Honeysuckle” - Amur honeysuckle, Bella’s honeysuckle, Marrows honeysuckle, and Tatarian honeysuckle. All can be identified by some general characteristics: they grow between six and 15 feet tall; they typically have paired fruit and flowers; they have hollow branches; and they are easily identified by the dark green, long lance-shaped leaf with a characteristic “bent tip”. Bush honeysuckle is the first to leaf out in the spring and the last to drop their leaves in the fall. The flowers are tube shaped and range in color from white to red. The berries range in hues of red. Bush honeysuckle out competes the native wild flowers and restricts the forest regeneration through restricting the survival of seedlings of the trees in the forested community. Because they are often the first to leaf out in the spring, they easily shade out the desirable native plants. This allows them to expand and crowd out other species increasing their competitive advantage. The reduction in plant populations has a negative effect on the animals in the ecosystem, as well. The reduction of native species reduces the number of native pollinators that are dependent on specific native plant species. Bush honeysuckle also reduced the number of native seed and berry producing plants required for the survival of wintering birds in Illinois. Though bush honeysuckle does produce berries, these berries are not a quality food source for bird species. They lack many of the required nutrients that the permanent bird residents need, particularly in the winter months. Controlling bush honeysuckle is vital to the preservation of native ecosystems in Illinois. Bush honeysuckle currently poses one of the greatest threats to forest ecosystems in Illinois. Simply cutting bush honeysuckle down will not kill the plant (in fact, it may cause the plant to spread out). The best way to control bush honeysuckle is to remove it completely (roots and the above ground portion of the plant). This is easily done on smaller plants. If the plants are one inch or less in diameter, this can be done by hand. If pulling the plant out completely is not a practical option, some success has been seen when the plant is cut off at the ground then treated with concentrated glyphosate applied directly to the cut stems. This is most effective when done in the spring or in the fall when the plant is most likely going to take the chemicals into the roots. When using this method, care must be taken to not apply to non-target plants. Burning has also shown to be an effective control method. Burning is effective when the fuel load is enough to create a fire of sufficient heat to remove the plant. Burning is needed for three to five consecutive years and should only be stopped when the presence of bush honeysuckle has not been observed for two growing seasons. Fire should only be used in extreme situations and a professional restoration company should be used. Fire exposes the soil and has the potential to allow other invaders to colonize the area. For more information, please contact Jason Haupt (jdhaupt@illinois.edu).